← Cadê o Morar Carioca? These comments weren’t made regarding Rio de Janeiro, nor any other Latin American city. They came from Richard Baron, founder of a company that redevelops some of the most depressed neighborhoods in the United States, in cities such as New Orleans and Detroit. 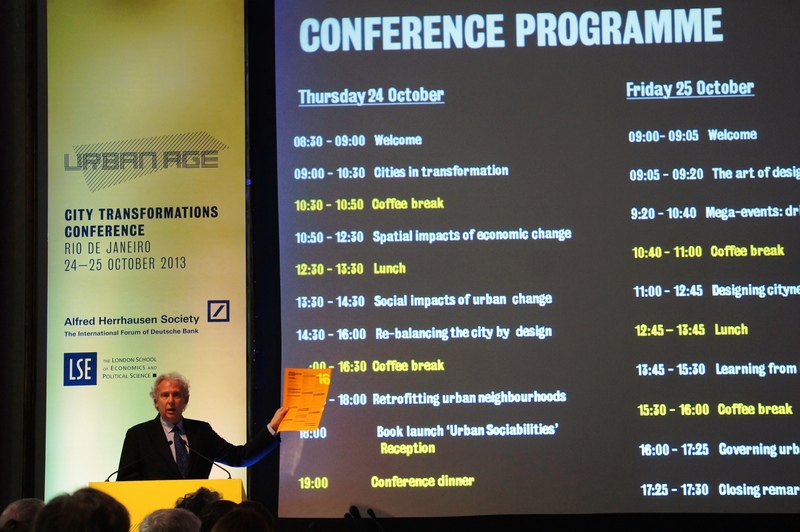 And they might have brought a measure of reassurance to top Rio government officials dealing with the tough challenges of urban transformation, focus of this year’s Urban Age conference, brought to Rio de Janeiro by the London School of Economics and Deutsche Bank’s Alfred Herrhausen Society. 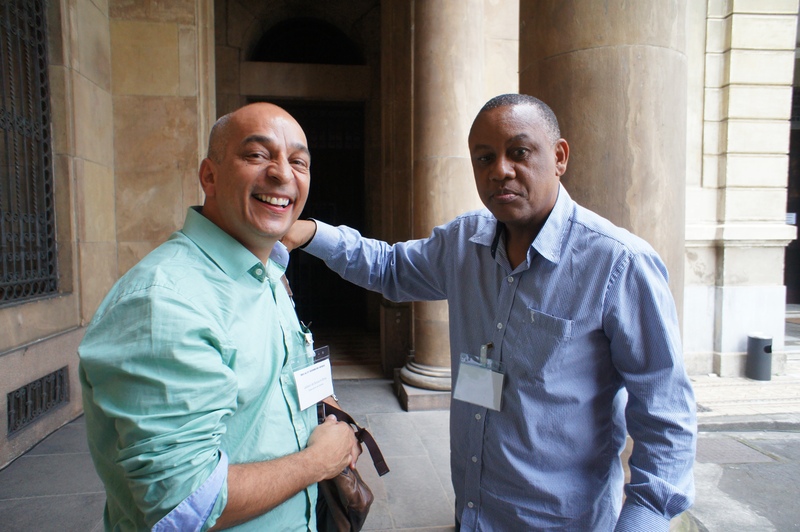 Absent city and state officials might also have been surprised to learn that Rio’s urban challenges pale beside those of African countries, discussed during a presentation by Edgar Pieterse, director of the African Centre for Cities at the University of Cape Town. Pieterse told participants that 62% of urban Africans live in slums, half the population is age 17 or younger, the labor force is set to triple by 2040 and 63% of Africans are in “vulnerable” jobs. Confirmed but missing speakers were five: Mayor Eduardo Paes, Governor Sérgio Cabral, CDURP CEO Alberto Gomes Silva (in charge of the port transformation), Rio Negócios chief Marcelo Haddad (in charge of attracting investment to Rio) and Paes’ chief of staff, Pedro Paulo Carvalho Teixeira. “Last year, in London, the prime minister came, as well as the mayor,” design critic Justin McGuirk observed, with disappointment. His book Radical Cities: Across Latin America in Search of New Architecture, is due out early next year. Those absent might have had a chance to hear about Richard Baron’s creative efforts to provide quality low-income housing that opens the door to life improvements. Baron puts together “layered financing” for his for-profit projects, tapping into funds at all levels of government, plus the private sector and foundations. He told RioRealblog that unlike Brazilian affordable housing, his units are rentals, not to be owned by those who live in them. This sounds like a far cry from Brazil’s Minha Casa Minha Vida program, which may have benefitted Brazilian construction companies and their employees, more than the people who eventually live in the homes. The conference also heard from São Paulo government officials, about new efforts to revitalize a central area, reduce commutes and provide low-income housing. The new ordinances are meant, she said, to bring density to all boroughs, create multiple urban centers, and focus on proximity to the subway. It should be noted that critics say the twelve-year tenure of Burden’s boss, mayor Michael Bloomberg, served to push many New Yorkers out of gentrifying neighborhoods — something that Rio is starting to experience. Even so, though such a full-fledged zoning redesign sounds like a luxury in our context, it’s certainly a task to consider for the future. 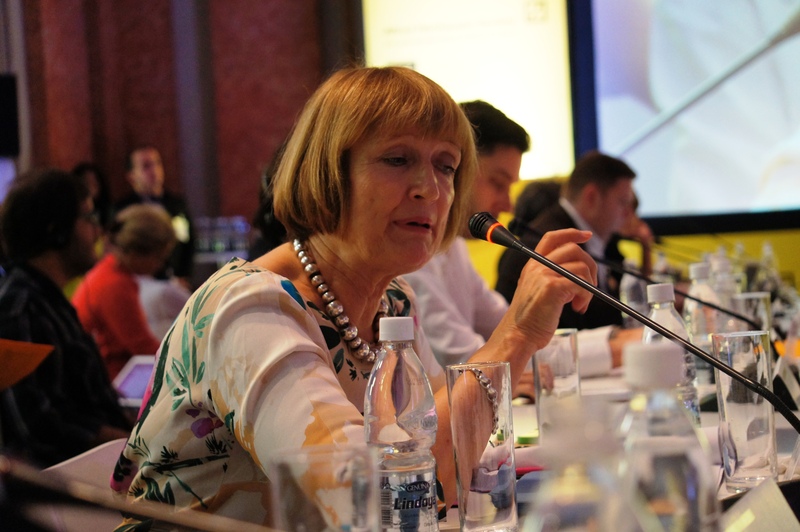 One of the most thought-provoking presentations was made by Dame Tessa Jowell, the UK Minister for the 2012 Olympics. She described doing sixty years’ work in six — turning around London’s five poorest boroughs, improving education and training, bringing young residents, the disabled and women into the construction industry, changing the affordable housing picture. The impact on the East End is still developing and has been the object of much debate. 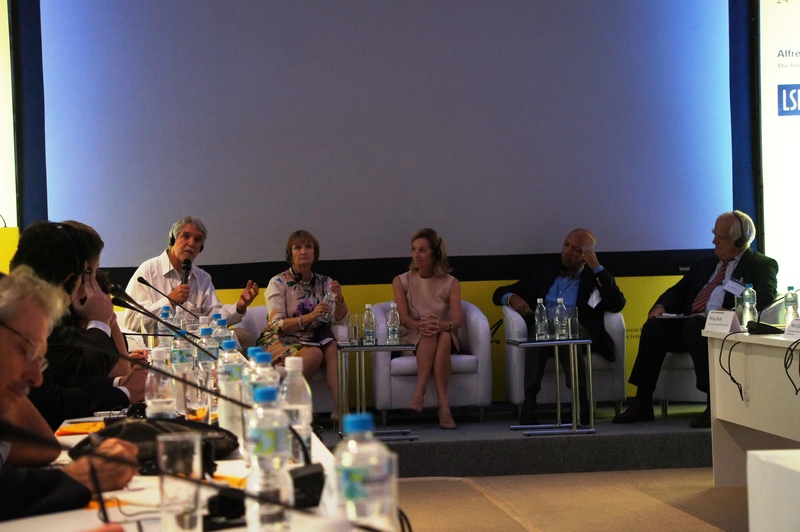 Jowell was followed by her Rio counterpart, Maria Silvia Bastos Marques, whose presentation focused on mobility and infrastructure as the centerpieces of urban transformation stemming from the Olympics. This led Andy Altman, 2009-2012 chief executive of the London Legacy Development Corporation, to bring up “soft infrastructure”. “How does the Brazilian legacy address inequality?” he asked her, giving all in the crowded room pause for thought. Bastos Marques, one of nine Rio officials who did show up, then spoke of the city’s Social UPP (which maps social needs in pacified favelas and coordinates the city’s response), the inclusion of English language lessons in all municipal public school curricula, and ongoing cultural change, sparked, for example, by new fines and a public education campaign to persuade cariocas to stop throwing trash on the ground. Compared to the London approach, this might all appear inconsequential, especially given Brazil’s standing as a BRIC and the fact that Rio de Janeiro hasn’t experienced the decreasing income inequality now occurring on a national level. There hasn’t been much public conversation here regarding the Olympic legacy and Rio’s socioeconomic challenges. Three years ago, Mayor Paes announced that as part of Rio’s Olympic legacy, all favelas would be urbanized by 2020 under the Morar Carioca program. But this has yet to happen on a broad scale, and part of the reason for delays may be bureaucratic and societal barriers to true urban integration. It can easily be argued that improved mobility and infrastructure investment do address inequality in very real ways, if indirectly. Workers in Rio spend more time commuting than those in São Paulo, a much more populous and larger city, time that could be spent to improve Brazil’s lagging economic productivity. And expensive flood control works in the Maracanã area should solve a problem that for decades has constantly damaged homes and businesses, crippling the city. Former mayor of Bogotá, Enrique Peñalosa (far left), a ferocious advocate of green space and dedicated bus lanes, shares ideas with Dame Tessa Jowell, Amanda Burden, former Washington D.C. mayor Anthony Williams and the founder of Transparency International, Peter Eigen. The panel sparked debate on corruption as a barrier to urban transformation. Mayor Paes and Governor Cabral travel a great deal and have surely compared notes with their counterparts around the world. But the conference, bringing together a current mayor, a deputy mayor and former mayors from five different cities, afforded a rare opportunity for ample debate and reflection. Many speakers mentioned the DNA of a city, a useful concept in the context of urban transformation. Will Rio maintain its DNA of conviviality and creativity? Or will gated automobile-dependent communities continue to sprawl in the West Zone while bizarrely shaped mirrored office buildings compete aesthetically with the harbor and surrounding mountains, in the Port area — leaving the old Center plus North and South Zones as quaint relics of a city that once was? And, as Adam Greenfield, author of Against the Smart City, asked, “What about the bits? What about sharing information?” as Rio modernizes yet struggles to protect its DNA. No official was there to describe Rio’s Operations Center nor official support for citizen-developed mobile applications. Last but not least, Rio’s Urban Age conference absentees missed out on a call to revolution on the part of mega-event host cities, from none other than Dame Tessa Jowell, who spoke of the “brutality” of the Olympics and the need to pay “day-to-day attention to the people who live [in host city sites]”. “There has to be a renegotiation with global bodies,” she suggested. “There need to be more equal relations with the International Olympic Committee”. To bring change, she suggested a coalition of cities work together with the IOC. This entry was posted in Brazil, Porto Rio de Janeiro, Transformation of Rio de Janeiro / Transformação do Rio de Janeiro and tagged Adam Greenfield, Alberto Gomes Silva CDURP, Amanda Burden, Andy Altman, Celso Athayde, Dame Tessa Jowell, Edgar Pieterse, Governor Sérgio Cabral, Jailson Souza e Silva, Justin McGuirk, Marcelo Haddad Rio Negócios, Maria Silvia Bastos Marques, Mayor Eduardo Paes, Minha Casa Minha Vida, Morar Carioca, Olympic Committee, Pedro Paulo Carvalho Teixeira, Richard Baron, Suketu Mehta, Urban Age conference 2013, Urban Age Rio de Janeiro, Urban Transformations. Bookmark the permalink. Please make this available as a link, so I can post it in the newsletter. I can’t post it from my email. Until when will Brazilians authorities behave this way, ignoring the opportunities to learn and better the lives of others? Quosque tande? Parabéns pelo seu trabalho Julia!!! Depois da entrevista no Jô Soares vc vai ter muitos seguidores. RIO EU AMO, EU CUIDO.